While some First Nations have signed deals with the energy company to allow the project, many others have not. Grand Chief Stewart Phillip, left, president of the Union of B.C. Indian Chiefs, speaks as Will George, a member of the Tsleil-Waututh First Nation and a guardian at the watch house near Kinder Morgan's Burnaby facility, listens during a news conference in Vancouver on April 16, 2018. Indigenous leaders are promising to continue the fight against Kinder Morgan's Trans Mountain pipeline expansion despite the prime minister's insistence that it will be built. "The prime minister is saying they are in negotiations with Kinder Morgan to ensure an end to uncertainty. What he is ignoring is that we are the uncertainty," said Will George, an organizer with Protect the Inlet from Tsleil-Waututh First Nation, in a press release Sunday. "We will not be bought and we will block this pipeline." While dozens of First Nations along the pipeline's route support the project, many others do not. Coldwater First Nation near Merritt, B.C. declined to sign a deal to allow Kinder Morgan to expand the existing pipeline on its territory, Chief Lee Spahan told APTN in an interview. The expansion would build a second pipeline parallel to the existing one, directly over an aquifer that is the community's source of drinking water, Spahan said. "If we have to, it'll be our Standing Rock," he said. "For us, it's not about the politics, but the future of our community and ensuring we have access to clean, safe water." The leader of the Union of B.C. Indian Chiefs has also vowed that the project will not proceed. 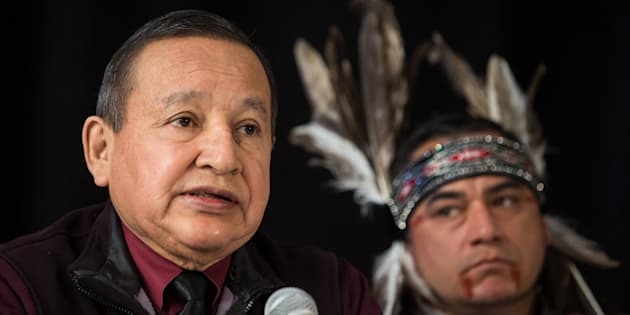 "We said we wouldn't let Kinder Morgan's ticking, highly toxic time-bomb of a pipeline expansion happen and we won't," Grand Chief Stewart Phillip said in a press release last week. In an op-ed for The Globe and Mail on Thursday, Phillip said that Canada could have an "Oka-like crisis" on its hands if Trudeau tries to force the pipeline through. In 1990, a police officer was shot and killed in Oka, Que. during a standoff over development of land claimed by the Mohawks of Kanesatake. "If the federal government tries to ram through this pipeline, it could mean going back to one of the darkest times in modern Canadian history," he wrote in the piece, co-authored with Serge Simon, grand chief of the Mohawk Council of Kanesatake. "We don't believe that's the Canada that most Canadians want to live in. It would be a cruel joke indeed if, in this era of 'reconciliation,' Canada instead repeats the mistakes of the past." Prime Minister Justin Trudeau reiterated to reporters Sunday that First Nations were consulted before construction began. "The approval process for this pipeline ... featured the most extensive consultation with Indigenous communities across this country that we've ever seen," he said. "It was with all that consultation done and with all that engagement done that we were able to approve that pipeline." Trudeau said that his government continues to engage with Indigenous communities "who still have questions and concerns." Trudeau met with the warring premiers of Alberta and B.C. in Ottawa on Sunday. B.C. 's John Horgan has staked his government's survival on opposing the pipeline, while the economic health of Rachel Notley's Alberta depends on it. Neither budged on their position after the meeting with Trudeau. Notley said her government will introduce legislation to allow it to alter the amount of oil that flows through the pipeline, while B.C. Premier John Horgan said he'll wait for a court reference on whether B.C. has the jurisdiction to regulate what can and can't flow through the expansion. Trudeau said the federal government is in talks with Kinder Morgan to reassure its investors. The company suspended "non-essential" work and spending on the pipeline last week, citing uncertainty about the project's future. CORRECTION: A previous version of this story indicated that Alberta government legislation aims to increase the flow of oil through Kinder Morgan's Trans Mountain pipeline. In fact, the legislation would give the energy minister power to restrict the flow of oil, gasoline and natural gas leaving the province.